a dental instrument, either air driven or electrically driven, that holds various disks, cups, or burs, used to prepare a tooth to receive a restoration or to contour, clean, or polish a tooth or restoration. An instrument for holding dental burs to remove tooth structure or to smooth and polish restorative materials. Handpiece rotations are measured in rotations per second. 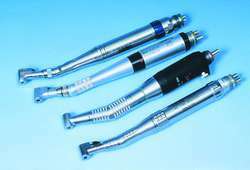 Handpieces may be powered by electric motor or air turbines and are characterized as high speed or low speed depending on their rotational speed. Overheated dental handpieces may burn oral tissues. A handpiece with one or more bends so that the shaft of the rotary instrument is at an angle to the handpiece to reach less accessible areas of the mouth for dental work. A dental handpiece that operates at speeds about 6,000 to 10,000 rpm. Low-speed handpieces are used to polish and finish dental procedures. The Company believes that it is the world's leading manufacturer and distributor of dental prosthetics, precious metal dental alloys, dental ceramics, endodontic instruments and materials, prophylaxis paste, dental sealants, ultrasonic scalers, and crown and bridge materials; the leading United States manufacturer and distributor of dental handpieces, dental x-ray film holders, film mounts and bone substitute/grafting materials; and a leading worldwide manufacturer or distributor of dental implants, impression materials, orthodontic appliances, dental cutting instruments, infection control products, and dental injectable anesthetics.